Map No.3 in the Dalriada Series. This is Burghead Fort, often credited as the largest Iron Age fort in Britain and was three and half time larger than any other Scottish forts at the time and is also the oldest Pictish fort in Europe, with earliest build dates of 300 AD. Burghead is in the north east of Scotland near Inverness and this fortress was probably the mighty seat of the northern Pictish kings. The Picts were the native habitants of Scotland and they controlled most of the land north of present day Glasgow and Edinburgh. This scenario is set around 560 AD. At this time, most of Britain was once again Pagan after the collapse of the Roman Empire, however Christianity had reached Ireland over 100 years earlier through St. Patrick and had been growing strong ever since. From 500 AD, a small Irish tribe known as the Scotti and whose Kingdom was called Dalriada had been crossing the sea to establish itself in what we now call Scotland. Their main enemy in Scotland were the Pagan Picts. 563. Enter Columbcille, now beautified as Saint Columba. Columba was an Irish monk with family ties to royalty. After a copyright dispute with his teacher that results in a bloody battle, Columba exiles himself from Ireland to convert as many souls in Scotland than were lost in the battle. The King of Dalriada grants him an Island to begin his missionary work. This Island would soon become a very powerful centre of learning, literacy, art, technology and monasticism with nobility coming from as far as mainland Europe to study under the monks. When Columba and his companions have established their base, he sets his eyes on his first mission; The Pictish King. Columba travels to Burghead to vist the Pictish King named Brudei I. In the zip file there will be more detailed background information/ story and a very useful visual walkthrough for most of you who will need it. I was looking for a decent well documented Pictish fortress that my Dalriads could attack. This was the best result that came up and I was really keen to recreate this impressive structure. I've tried to be as faithful to my sources as much as possible. 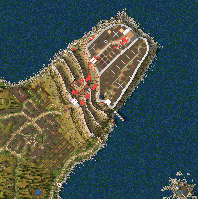 I didn't create this map for one tiny little mission, there will be a battle scenario in the future. Gather together the forces Ithélâ has given you. Launch an attack on his fortress. You will need to dig through the moat and reach the walls. Kill the enemy Lord and all enemy troops whilst keeping to the time limit. >Be quick to execute your plan. >Don't let your troops die. Wl_D Arthus for playtesting this week and giving me some vital feedback. Lord Michael I for playtesting around three years ago and he gave some good tips for improvement. Wow, map looks beautiful like from a fairy tale or just the legendary past. The concept of a single hero (with a tiny fixed force around him), seldom in SH1/SHC, sounds clever and promising. Hope you have a good time playing it. Wow, I gotta install SH1 again to play this beauty! Right, the map looks beautiful from afar. You have made a great map,i really enjoyed just looking at it in the editor. A well made and thought out map indeed. Thanks for all the kind comments, how have you found the gameplay? I really enjoyed playing this map, the first few times I tried without the walkthrough and failed miserably. Ofc I looked for the weakest spot where I could break in and saw the wooden gatehouse. Then I noticed the wolves. Didn't know that if too many troops died I would lose (didn't read any instructions at first), and thought that the disciples/engineers were intended to man the shields/siege tents. Second time Columba walked onto a random Killing trap. Third time I was too late and the hunting party killed everybody. And then the fourth time I moved around the map, looking for clues, and saw that the front gatehouse was badly damaged, but once again fell victim to yet another trap. Not until I read the walkthrough did I realize that the monk had to walk between the spikes in a straight line. And, I probably never would've. So I studied the walkthrough diligently and suddenly an epiphany came to me. Afterwards everything was as easy as pie. I knew the killing pits would be tricky to avoid...maybe not the best addition in the map.